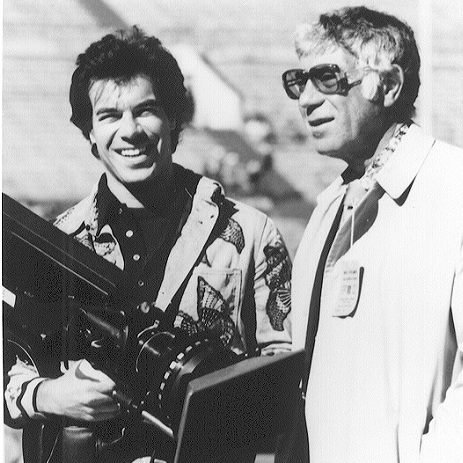 The father and son team of Ed and Steve Sabol, together, have combined their love and devotion of professional football and creative abilities with the camera into one of America’s best known and most highly regarded film and video production companies, NFL films. Ed was a champion swimmer at Blair Academy in New Jersey where he lettered in football, track and swimming. As a swimmer, he set a world’s interscholastic record in the 100-yard freestyle. At Ohio State University, he won big 10 and national AAU championships in 1937 as the leadoff swimmer in the 400 yard freestyle relay. While at Ohio State, he was selected for the 1936 Olympic team. He declined the honor, publicly stating that he would not swim in a pool built by Adolph Hitler. In 1962 he turned a film hobby into a career with the establishment of Blair Motion Pictures. He was awarded a bid from the NFL to shoot the 1962 Packer-Giants title game. It was such a success that he went on to film the 1963 and 1964 championship games. In 1964, he convinced the NFL that it needed its own motion picture company to promote the NFL and preserve the history of the game. The league agreed and NFL Films was born. The same year Steve, a former all Rocky Mountain Conference running back for Colorado College, began working for NFL Films as a cinematographer. Now president of the company, Steve is recognized throughout the world as an innovator and has personally received 26 of the 69 Emmy Awards won by NFL Films. His contributions to the movie industry also include work on a number of feature films, including “Semi-Tough”, “Paper Lion”, “Brian’s Song” and “Black Sunday”.